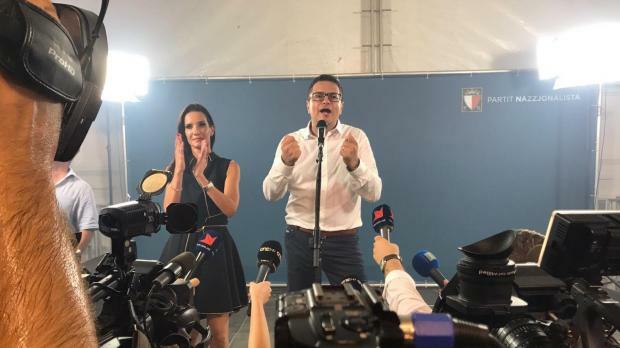 Adrian Delia is the new leader of the Nationalist Party, having won 53 per cent of the vote in the contest against his rival Chris Said. Dr Delia won 7,734 votes from the party members, compared to 6,932 for Dr Said. 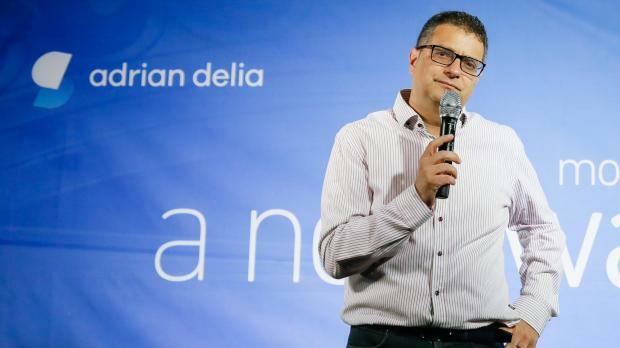 "From tomorrow, people will hear the PN speak with one voice, with a strong voice, a stable voice," Dr Delia told a crowd at the Granaries at around 12.50am when his victory was clear. "Thank you for those who chose a new way." A roar ripped through the hall at around 12.40am as those backing Dr Delia began celebrating the evident win. Dr Said conceded defeat via Twitter, congratulating his rival and urging his followers to focus on "uniting the party". He confirmed that indications showed the vote falling 55-45 in Dr Delia's favour. 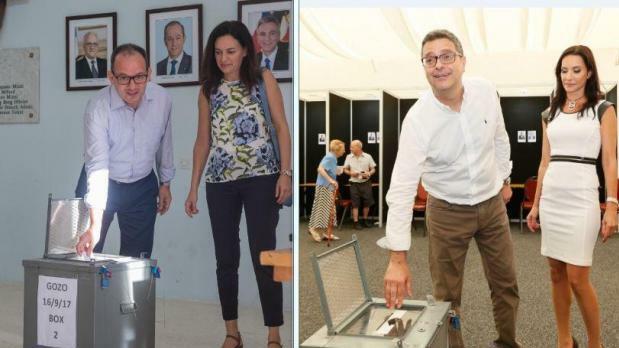 Simon Busuttil also took to Twitter, congratulating his successor on his win while telling him that he now had "the responsibility of finishing what we started." The two leaders, past and present, appeared on stage together at 1.15am and shook hands. Dr Delia then gave his first address as PN leader. Dr Delia used the speech to reassure party members that he wanted to continue the "battle" for truth and honesty which his predecessor had started, saying "we will continue to fight it with all our energy and will." But he also made it clear that he would be doing some things differently, telling the crowd that while the PN he led would continue to speak out against wrongdoing, he wanted it to be "a constructive opposition." "We must condemn that which is wrong," he said. "But this will be a PN which shows that there is no room for hatred in Malta." Hatred and divisiveness, he went on to say, were the biggest challenges facing the PN and the nation. Speaking to journalists, he said that he had spoken with his rival Dr Said and urged him to begin working with him "from tomorrow morning" to unite the party. Dr Delia won over the majority of PN members despite much of the party administration making it clear they favoured insider Dr Said. Media reports questioning his financial solvency and business interests as well as allegations that he helped move money linked to a prostitution ring in Soho also failed to dent his popularity with PN grassroots members. A political newcomer who has never previously contested an election on a party ticket, Dr Delia’s leadership pitch hinged on his promise of a ‘new way’ of doing politics. Dr Said and Dr Delia cast their votes earlier today. Although details about his political vision have been hard to pin down, his ascent to the top of the PN is expected to lead to a seismic shift within a party which has seen its self-image shattered by two successive general election thrashings at the hands of Joseph Muscat’s Labour Party. Dr Delia has pledged to open up the PN and during the campaign said that one of his first acts as leader would be to commission a “sociological study” to better understand what the electorate wanted to see prioritised in their lives. He has also said that poverty “is the issue closest to my heart” and insisted that allegations that dogged him throughout the campaign will not hinder the PN in pushing for reform to ensure the independence of the judiciary or regulatory bodies. The Birkirkara lawyer began his career as legal counsel for Mid-Med Bank before branching out as a litigator. He is a senior partner in Aequitas Legal and until a few months ago served as president of Birkirkara FC. 14,735 party members cast their vote for Dr Delia or Chris Said in the second round of the electoral contest. According to official figures released yesterday, 2,597 of those votes were cast last week. 95 per cent of eligible voters went to the ballot today, with voting stations closing at 8pm in Gozo and an hour later in Malta. A heated leadership race kept bubbling over until the very end, with reports of tension at polling stations this morning.